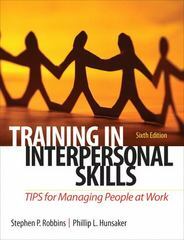 Training in Interpersonal Skills 6 Edition An applied approach to developing and practicing interpersonal skills. By developing and practicing the material in Training in Interpersonal Skills, readers can learn how to build productive relationships for any situation. This text also helps readers master the skills necessary for personal and organizational effectiveness such as self-management, communication, teaming, and problem solving. The sixth edition includes several new pedagogical tools–such as self-assessment quizzes, exercises, cases, etc.–and information on the importance and usage of social networking.